It seems the screws that attach the pre-tensioner to the retractor mechanism can loosen over time as a result of frequently opening and forcefully closing the access door. It these screws work themselves loose, they may release the pre-tensioner and retractor spring cover, thus compromising the system’s proper function during an accident. 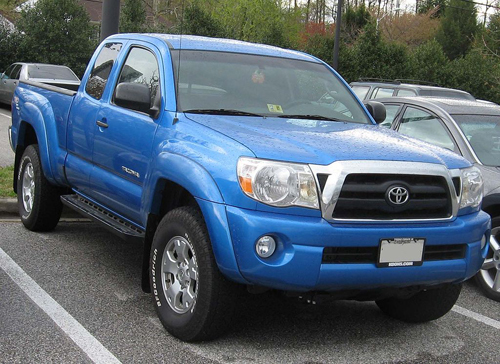 The recall affects approximately 342,000 Toyota Tacoma Access Cab vehicles, produced from 2004 to 2011. Known owners of these vehicles will receive notification of the voluntary recall in the mail. This is the seventh voluntary recall issued by Toyota this year. The others involved problems with the 2012 Yaris, 2010 Prius, 2010 Lexus HS 250h, 170,000 varied vehicles for airbag faults, 2007 to 2013 FJ Cruiser models, 2003-04 Toyota Corolla and Matrix, plus 2006-12 Lexus IS models. The combined recalls issued so far in 2013 involve some 1,830,000 vehicles. Over the past 13 years, this is but a small percentage of the vehicles sold by the combined nameplates of Toyota Motor Sales, USA.